Liberals have been pushing for businesses like McDonald’s and Walmart to pay a “living wage” to their employees — usually around $15/hour. But as they have no understanding of basic economics, they also don’t understand what the consequences would be. But if they didn’t before, they will now — McDonald’s has begun replacing their cashiers with automated kiosks and they’ve had stellar results so far. McDonald’s announced that they would be replacing counter employees with the kiosks in 2,500 stores — and their stock shares almost immediately skyrocketed. And according to Andrew Charles, a research analyst with the financial services firm Crowen, it’s because of the kiosks. Charles has raised his interests because of the cost savings plan, raising his valuation of McDonald’s shares from $142 to $180, for an increase of 17.5%. “MCD has done a great job launching popular innovations within the context of simplifying the menu, while introducing more effective value initiatives that have recently begun to improve the brand’s value perceptions,” he wrote. McDonald’s has been struggling the past few years, so this is much-needed good news for the fast-food chain. Offering breakfast all day was supposed to help revitalize the chain, but stocks still fell. 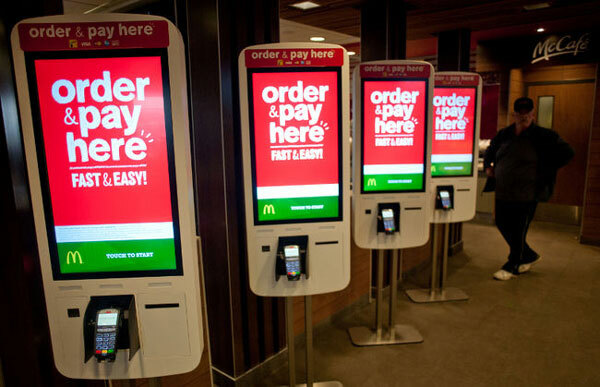 Liberals will undoubtedly be furious to hear that lower production costs turned out to be what McDonald’s needed to turn things around… because if they keep pushing for a $15/hour minimum wage, there’s no guessing what McDonald’s will do: replace counter employees with automated kiosks at all of their stores across the country.